Rollins partners with The Education Abroad Network (TEAN) to offer this incredible program at the University of Newcastle, where you'll live and study alongside Australian and other international students in this unique natural setting. On this program, you’ll enjoy the benefits of studying at the University of Newcastle, with access to all campus courses, facilities and activities, as well as the support of TEAN’s full time Resident Director. The program emphasizes Australian Studies and students are encouraged to pursue the Rollins Australian Studies Minor in conjunction with their study abroad experience. In addition, you'll also have access to a wide range of courses at Newcastle and this program is an excellent fit for most Rollins majors and minors, including those studying science and business disciplines, Film, Critical Media and Cultural Studies, Communications, Environmental Studies, Global Health, Math, Music, Psychology, etc. In addition to its wealth of academic offerings, Newcastle has a variety of volunteer, service, and leadership opportunities for students, and thus, it’s a great fit for Bonner Leaders! Although you are responsible for booking your own flight to Newcastle, TEAN will assist you through one of their preferred vendors (which is not an airline specifically, but more like a booking agency). TEAN will provide the vender with all relevant arrival/departure details pertaining to this program. Rollins strongly recommends that you use this vendor as they are not only trusted, but they also have all of the details regarding your routing; such as which cities you'll need to stop in as part of your orientation (see below) and how long you'll be in those cities. The estimated cost of this flight, departing from the U.S. west coast, is approximately $1,800. You will also need to book your own airfare that takes you from home to the U.S. west coast. TEAN’s exclusive 6-day “Welcome Abroad” Orientation Program takes place in Cairns, in the north of Australia. Cairns is famous for its tropical setting and access to the Great Barrier Reef – what better way to start the semester than a week full of adventure; including scuba diving and snorkeling on the largest coral reef system in the world?! This Orientation is designed to set you up for a successful semester by introducing you to the local culture and academics while also getting to know your soon-to-be friends and having an exciting journey in the process. You’ll spend a full day on the reef, explore the rainforest village of Kuranda, watch Aussie films at TEAN’s outdoor cinema screening night, and will wrap up an adventure-filled week with a sunset dinner cruise. TEAN's in-country staff will be there to personally guide you through orientation sessions and all the unique activities planned for the week. A sample itinerary can be found here. PLEASE NOTE: TEAN does NOT provide transportation from Cairns to Newcastle. Students will be responsible for purchasing their own airfare between the two cities. U.S. citizens DO need a visa in order to study in Australia. The Australian visa application is an entirely online process and payment must be made by credit card at the time of application. For more information about the visa process and visas for non-U.S. citizens, see our Passports and Visas Page. TEAN is a study abroad organization based in Chicago, and it runs and operates this program in coordination with Newcastle. TEAN has been developing high quality study abroad programs for American students since 1995 by establishing partnerships with universities across the South Pacific and Pacific Rim. TEAN will provide Rollins students with a comprehensive orientation program, organized cultural activities in and around Newcastle, and the support of a full-time, local Resident Director. 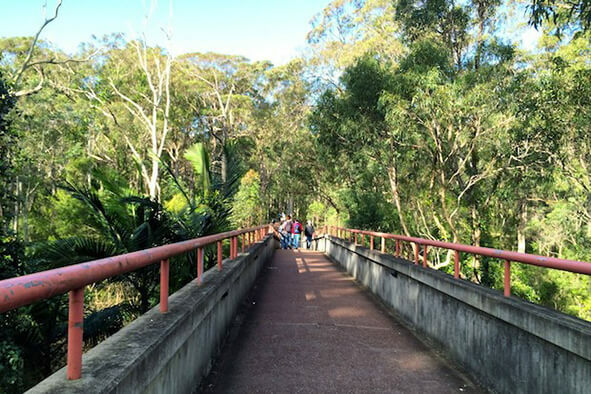 The University was established in 1965 and is one of Australia’s most naturally beautiful campuses. In fact, it prides itself on protecting the flora and fauna that call the area home and has established many environmentally protected habitats on campus. It’s based approximately 7 miles west of the city centre, thus, the campus and city are well connected via train and bus – and many students often use bikes to travel around the area. Newcastle is roughly two hours north of Sydney and is surrounded by wineries, national parks, and miles of beaches. It has a relaxed coastal lifestyle, diverse nightlife, award-winning dining, and burdening arts culture. The people are friendly, the beaches are postcard perfect and the coffee culture is taken seriously. It's truly a great fit for students seeking an engaging learning environment combined with opportunities for outdoor exploration. The university itself is composed of five faculties (or academic departments), 16 schools, more than 10 research institutes. It hosts nearly 17,000 students, 5,600 of which are international students. Newcastle has a vibrant research culture and also focuses on problem-based learning (described locally as a “hands-on approach to teaching”). You’ll also benefit from extensive student support services provided to all students, including academic skills support, on-campus security, health services, disabilities support services, a counseling center, multiple computer labs, sports and recreation facilities - including a 50-meter indoor pool, more than 60 student clubs and societies, and multiple cafés and restaurants. Newcastle offers more than 2,000 courses, so there are bound to be plenty of options that fit your major/minor. Students on this program must take four courses; two courses from the below list of "Australian Studies Courses," and then and additional two courses directly from the university's course catalogue. Because this program functions like a direct enroll program (meaning you’ll take regular university classes with local students and other study abroad students) you'll have a wide range of courses to choose from - pending equivalent prerequisites and enrollment capacity. Courses at Newcastle are typically worth 10 "units," which translates into four Rollins credit hours. Students typically take four courses at Newcastle, and in turn, will typically earn 16 Rollins semester hours on this program. Newcastle Courses Follow this link to Newcastle's online course catalogue. Once inside the catalogue, make sure the courses you're exploring are available at the “Callaghan Campus" and are held in "Semester 1." Newcastle's semesters are switched, so the Rollins spring semester is actually the first semester of their academic year. The academic system in Australia can be quite different than the U.S. system. There are generally fewer class, or contact hours, per week than in the U.S., and there is less continuous assessment of your academic performance. Semester grades are typically based on only one or two major assignments, such as a midterm and final exam. Daily assignments are rare. Therefore, each paper, assignment, test, project, etc. often carries more weight for your final grade than what it might carry here at Rollins. In addition, students entering university are typically already focused in their major or academic specialization. Thus, introductory courses at Newcastle typically cover topics that might not be covered until later levels at Rollins. For example, 100-level courses at Newcastle are considered introductory, or equivalent to U.S. first and second year courses. 200-level courses are considered intermediate, equivalent to our junior level courses. And 300-level courses are considered equivalent to our senior level courses. Students participating on this program will need to seek approval for courses in their major/minor (from the appropriate academic department) and for general Rollins credit (through Student Records). All courses on this program will appear on the Rollins transcript as transfer credit. Grades from this program will also appear on the Rollins transcript and will be factored into the Rollins GPA. Students who successfully complete this program through Rollins will receive an official transcript from Newcastle. It can take up to 3 months to receive the official transcript. You'll live in modern, on-campus housing, which is operated by Newcastle's UON Student Living. UON Student Living is the university's on-campus residential area and has won awards for its unique ResLife program. Their student-focused facilities include study areas, common rooms and indoor and outdoor social spaces. They also provide 24/7 security (like CampusSafety) and Resident Assistants that live inside the res. hall (just like at Rollins). Living on campus will provide you with an opportunity to make new friends and connections, while having easy access to all sporting, library, health, and academic facilities available. You can choose to live in a single room, shared room, or a single room in a 5-6 bedroom apartment. There are no meal plans available at the University. You will also have a shared kitchen stocked with basic tools and utensils, and the opportunity to buy your own groceries. Note: If on-campus housing is not available, students will live in TEAN-managed apartments off-campus with other U.S. students. The TEAN Resident Director will coordinate various activities during the semester designed to help immerse you in the local culture. Past activities have included surf lessons, local sporting events and music festivals, and trips to the Sydney opera house. You'll also have access to all of the University's clubs and societies and the new, state-of-the-art gym, complete with indoor climbing wall. Newcastle also has a well-established leadership program, called iLEAD, which allows students to gain experience/skills in leadership, community engagement, and international awareness through participation in a variety of seminars, volunteer opportunities, community activities, etc. iLEAD is free to join and you'll need to accrue a predetermined amount of points through participation in various activities, each of which has its own point total. Once you receive the full amount of points you'll receive a completion certificate. Newcastle also offers a cross-cultural friendship program through which volunteers from the local community link with international students. The program enables you to learn more about Australian culture while sharing information about your home culture with others. In addition to the orientation program in Cairns, TEAN also offers students optional excursions prior to the semester and during the semester breaks. These include destinations such as New Zealand, Thailand and Melbourne, Australia and are fully coordinated by TEAN. Students wishing to join these optional excursions would need to pay for them directly as they are not included in the program cost. Tuition and program administration, on-campus housing, some meals, University of Newcastle Student Association membership, airport pick-up, health and emergency insurance, orientation program (in Cairns and at Newcastle), transfer to Newcastle from Sydney and a farewell dinner.